The Emory Interventional Cardiology fellowship program is a one year fellowship program that was started by Andreas Gruentzig in 1980. 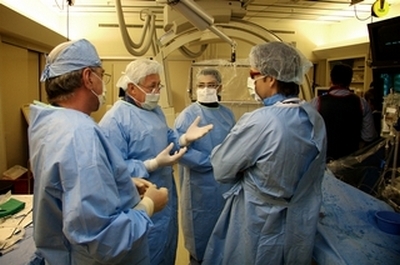 Emory is renowned for its pioneering work in interventional cardiology and has maintained a reputation as one of the preeminent training centers in the world. Dr. Habib Samady is the director of Interventional Cardiology at Emory where he leads a team of 13 board certified interventionalists. Approximately 2,500 interventional coronary procedures per year are performed at four Emory Hospitals, encompassing 10 catheterization laboratories. All fellows gain an exposure to interventional cardiology during their training. Those that wish to pursue a board certification in Interventional Cardiology spend their fourth year of fellowship in dedicated interventional rotations. Emory is home to one of the busiest structural heart disease programs in the country. We offer an additional one year training program in structural heart disease under the direction of Dr. Vasilis Babaliaros. Fellows actively participate in clinical trials. New interventional devices, restenosis and thrombolysis trials, studies evaluating methods to assess stenosis severity, as well as studies of coronary physiology, are some examples. Recent trials include radiation therapy to prevent restenosis, the Lovastatin Restenosis Trial, trials evaluating new stent designs, as well as studies in directional and rotational atherectomy, radiation, and laser revascularization. Additional studies include studies of glycoprotein IIb/IIIa antagonists in unstable angina and post myocardial infarction (RESTORE and EPILOG), the EAST (Emory Angioplasty vs. Surgery Trial), and GUSTO trials. Evaluations of imaging methods such as quantitative angiography and intravascular ultrasonography are also studied. December 1, 2019 is the application deadline for Fellowship starting July 1, 2021. Download the Application Package. Note: Emory Interventional Cardiology does not participate in ERAS. Supervision by interventional cardiology faculty members is expected throughout the academic year and during all aspects of the educational experiences. Each component of patient care must be carried out jointly by the interventional cardiology trainee and the supervising Emory interventional cardiology faculty. During weekdays each faculty member is responsible for his/her patients. Faculty members can be accessed through the paging system. In case of non-availability, a faculty member pre-arranges coverage and informs the Heart Center operator. There is a schedule for the interventional faculty "doctor-of-the-day" for back-up coverage during weekdays. There is a faculty call schedule for weeknights and weekends. The Interventional Cardiology training program is integrally affiliated with and is a component of the ACGME-accredited Cardiovascular Disease Subspecialty Training Program of the Emory University School of Medicine. Five trainees are accepted each year for one year of training. Trainees rotate between Emory University Hospital, Emory University Midtown Hospital, and at the Atlanta Veterans Administration Medical Center. Trainees work only with Emory full-time interventional cardiology faculty.